Every three years, there’s a dynamic world of industry and chemistry that come together on an international scale to share the latest in chemical production, process and instrumentation. 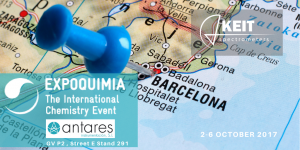 This year in Barcelona, Keit Spectrometers will have an instrument at Expoquimia on display at the Antares Instrumentacion exhibit stand (GV P2, Street E, Stand 291) with a running demonstration of the IRmadillo™ FTIR spectrometer Come see the rugged instrument in the Spanish “Ciudad Condal” and find out how a solid-state sensor opens up a world of possibilities to what chemical manufacturers can achieve using mid-infrared spectroscopy. Can’t make it to Barcelona? Keit’s travel schedule is packed this autumn. There are lots of opportunities to connect with us live around the globe. Click on our Events tab for an updated list of all the places we’ll be. If you’d like to follow our updates, connect with us on LinkedIn, and Twitter. We’ve got lots going on!